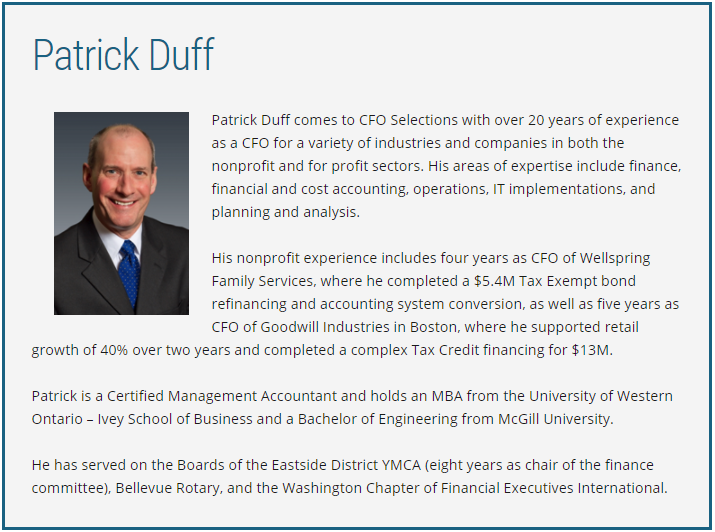 Patrick Duff comes to CFO Selections with over 20 years of experience as a CFO for a variety of industries and companies in both the nonprofit and for profit sectors. His areas of expertise include finance, financial and cost accounting, operations, IT implementations, and planning and analysis. 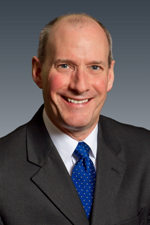 His nonprofit experience includes four years as CFO of Wellspring Family Services, where he completed a $5.4M Tax Exempt bond refinancing and accounting system conversion, as well as five years as CFO of Goodwill Industries in Boston, where he supported retail growth of 40% over two years and completed a complex Tax Credit financing for $13M. Patrick is a Certified Management Accountant and holds an MBA from the University of Western Ontario – Ivey School of Business and a Bachelor of Engineering from McGill University. He has served on the Boards of the Eastside District YMCA (eight years as chair of the finance committee), Bellevue Rotary, and the Washington Chapter of Financial Executives International.